Our favourite Mother-daughter duo Health Synergy have shared the secret to the ultimate creamy soup! 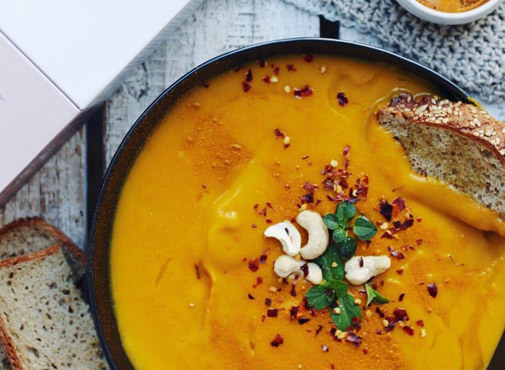 Pumpkin soup is a winter essential. So nourishing. The secret to the ‘creamy’ consistency is the inclusion of our own homemade cashew milk. To make your own simply blend 1 cup raw cashews with 3 cups filtered water and voila! Too easy. We’ve also added the warming and medicinal spice, ginger. Ginger is said to help with digestive complaints and nausea, it is anti-infammlarory and can improve circulation and cardio-vascular health… Just a few more reasons to include ginger in your diet! Turmeric is another great anti-inflammatory spice used in this recipe. Something a little different about this soup is that we’ve added a few scoops of ProPlenish marine collagen. As we always say, we have ProPlenish every day which helps to strengthen hair and nails and promotes clear skin. Up until recently we had only ever thought to add it to smoothies until we discovered that it is actually heat stable, meaning that nutrients are not depleted when heated… So we figured why not start adding it to our soups/savoury dishes! It doesn’t alter the taste at all and is a great way to ensure you don’t miss out on your daily collagen fix. 1. Braise onion and leek in coconut oil over low heat for 3-5 minutes. 2. Add chopped kumera, pumpkin and filtered water. Cover and leave to simmer for 10-15 minutes, or until vegetables are tender. 3. Add turmeric, ginger and salt and simmer for a further 5-10 minutes. 4. Transfer to blender, add ProPlenish collagen and blend until smooth. 5. Return to heat and slowly add cashew milk (add more if you would prefer a thinner consistency). 6. Serve with a dollop of coconut yoghurt (optional), fresh herbs, salt, pepper and/or toast. To see more great recipes from the beautiful team at Health Synergy visit their website or download their app from the app store here.